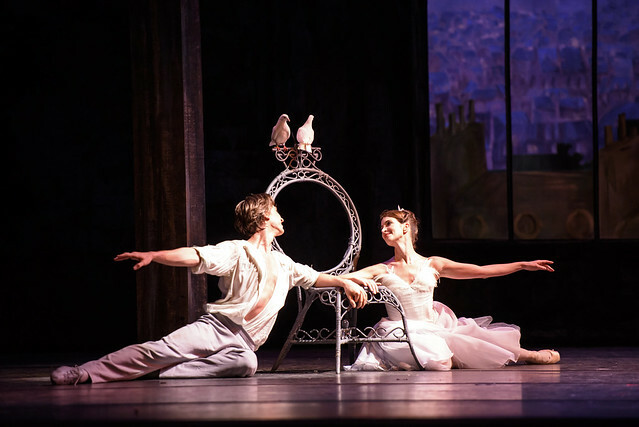 Lauren Cuthbertson as the Young Woman and Vadim Muntagirov as the Young Man in Frederick Ashton’s The Two Pigeons, The Royal Ballet © 2015 ROH. Photograph by Bill Cooper. 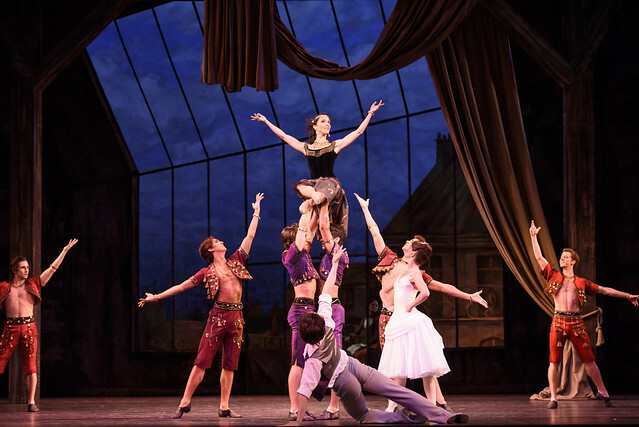 Laura Morera as the Gypsy Girl in Frederick Ashton’s The Two Pigeons, The Royal Ballet © 2015 ROH. Photograph by Bill Cooper. Laura Morera is the star of #ROHasphodelmixed . @Liam_Scarlett’s muse and the undisputed Ashton queen of @TheRoyalBallet ???????????????????? What did you think of Asphodel Meadows / The Two Pigeons? Share your thoughts via the comments below or by using #ROHasphodelmixed. Asphodel Meadows / The Two Pigeons runs until 13 February. Tickets are still available. Julia and Hans Rausing and the Paul Ferguson Memorial Fund. The Two Pigeons is staged with generous philanthropic support from Lindsay and Sarah Tomlinson and the Friends of Covent Garden. I really enjoyed this programme. Lots of dancers involved much of the time which I like. Well done the pigeons. I wonder why the cast I saw at the matinee on the 19th January are only dancing this programme once. Wonderful double bill. I hadn’t seen Asphodel Meadows before and really enjoyed it. Laura Morera and William Bracewell were outstanding in this. I had already seen the Two Pigeons but I don’t think I’ll ever tire of it. Ashton’s genius was to make such a moving ballet out of a superficially thin plot - wonderful! And the partnership of Cuthbertson, Muntagirov and Morera was simply magic. Is there any role that Muntagirov can’t dazzle in? And even the Pigeons behaved impeccably! This is an attractive double bill which was very well cast at Saturday's matinee, without a single company Principal! Fumi Kaneko was authoritative in Asphodel Meadows and Claire Calvert was alluring and sassy in The Two Pigeons, to name but two. Both ballets get better at every viewing and the music is glorious. Anything with Vadim in is wonderful, he is amazing and so talented. A wonderful mixed bill which will please anyone who loves classical ballet and great dancing. The mystery is why we have had to wait so long to see a revival of Scarlett's Asphodel Meadows and more importantly why no one seems to have made any effort to sell this mixed bill? Could it be that the marketing department has spent so much time playing jiggery-pokery with seat prices and reclassifying seats into different price bands for each ballet programme that it has not had sufficient time available to perform the basic function of a marketing department which is not only to tell people what ballets and operas are being performed but why they should go and see them? Anyone who knew anything about ballet would know that a one act ballet which has not been seen for six or seven years might need a bit of effective publicity to prompt ticket sales and that the second revival of an Ashton ballet that had been neglected for thirty years might need a bit of help as well. Why not try to write something that would persuade the public to buy tickets for this incredibly satisfying mixed bill? Just got home from this afternoon's matinee. Loved Asphodel Meadows, beautifully danced. Two pigeons with Yuhui Choe and Alexander Campbell was lovely. Welcome back Alexander! I attended the matinee performance of this double bill on 2 Feb. Lots of very excitable children around, always good for the mood in the house. I had never seen Asphodel Meadows before. Well crafted but ultimately only saved by the music and the two pianists - and some very good dancers. I hadn't seen 2Ps for a long time when I saw it again two or three years ago. On that occasion it looked ripe for the moth balls. Not so this time. Yujui Choe has got wings that flap expressively, not a bundle of biceps and triceps and traps. She was delightful, projected well right up to the amphitheatre. Her feet were like soft paws (no long, steely daggers that are more suitable for Balanchine ballets here). Alexander Campbell was perfect, young, slightly naive, credibly repentant (but he might go off again, watch him). Their dancing inspiring and Ashtonian. They made the case for keeping this ballet in rep. The ever so slightly undisciplined gypsy boys and girls really drew the audience into their camp. Did one pigeon, or rather dove, take a small liberty with its script? Did I see this right, did Alexander Campbell do a full turn as he came down the stairs to show the pigeon on his back to the audience. Wow. True stagecraft! Mayara Magri was quite mesmeric she actually becomes the characters she dances. Wonderful evening im going again. Thank you! Yuhui Choe had a great comedic sense and was very touching in Saturday's matinee of Two Pigeons. She has a real feeling for the Ashton style and took the ballet to another level. She really ought to be made a Principal. I completely agree with the last comment. Yhui Choe was completely adorable and so moving. Why has she not been made a Principal? She thoroughly deserves it and I would love to be able to see her dance more principal roles like Juliet and Giselle. Alexander Campbell was also fantastic and so musical. They had great chemistry. It was true to it's billing as a mixed programme: one was outstanding and the other was awful, a waste of good music and dancing talent. I had to read up what Asphodel Meadows was about but that didn't help, it could have been about anything. With the same music and brief, I fancy Ashton would have presented something memorable. Two Pigeons was a delight with yesterday's pairing of Cuthbertson and Muntagirov. What a wonderful way to spend Tuesday evening. I had not seen Asphodel Meadows before and it was stunning, mesmerising ballet and wonderful music.Unbelievable that a 24 year old could have produced such beautiful choreography; what talent. I had seen the Two Pigeons in 2015 but this performance was far superior. Lauren Cuthbertson is a joy to watch, such a versatile performer - the victim in The Judas Tree, the steamy lover in Strapless, a romantic Juliet and here such a fun, entertaining, mischievous portrayal of the Young Girl - a beautiful technical execution. It was a brilliant pairing with Muntagirov; his performance has matured so much; so resourceful. Laura Morera is just a delight- she made the gypsy role her own; danced with precision but also fun and flirty; she makes you want for more. The orchestra conducted by Barry Wordsworth - the icing on the cake. Simply gorgeous - I'd seen an excerpt of Asphodel Meadows before but not the whole thing, and it was worth waiting for. Scarlett is so musical and the duets are beautiful, as are the sets and costumes. The opening night cast of Nunez, Hirano, Morera, Bracewell, Hinkis and Acri were on form, totally in command of the choreography (those incredible lifts!) and emotionally moving. I don't think one needs to know or believe it's about the underworld or departed souls - you can overthink a ballet and miss the beauty of the movement. I think it works as a plotless ballet that has 3 very different and expressive parts, just like a violin or piano concerto in a concert hall (well, it is set to a concerto after all). I'm not sure why the Guardian critic was so glum about the double bill - it's like someone going to La Fille mal Gardee and complaining that the ballet is too happy! John Lanchbery has done a great job with the music and the final pas de deux (with the music, the story and the pigeons!) is sheer heaven. Even the non-ballet enthusiast in my party was entranced by the humour, the colour, the dancing and the adorable pigeons. We loved it so much that we booked to see more performances - we were so glad we did. Choe and Campbell are absolutely stunning in this - they know how to bring out the humour and nuances of the story without overdoing the jokes, and they have the lightness and speed that characterise Ashton ballets. Edmonds also made a great Gypsy Lover in that cast. There should be another cinema relay of The Two Pigeons with Choe, Campbell, Morera and Edmonds - the world needs to see them in these roles! Don't give a cats for your promotion procedures any more. Fumi Kaneko brilliant, obvious choice as a principal. The Ashton production was sheer magic. Le Deux Pigeons utterly charming gorgeous music from Andre Messager. Fond memories of Lynn Seymout and Christopher Gable,Not forgetting Doreen Wells and David Wall (RIP).Dancers of today danced it with true Love and affection.Fred was a genius to be sure. We attended the RBS/Two Pigeons on Tuesday 12th. The children were all very charming and their dedication to the art of ballet clearly visible but the main reason we booked was to see Yasmine Naghdi's debut in Two Pigeons, partnered by Alexander Campbell. Yasmine's technic is clear as crystal, sharp as a diamond, never does she disappoint. Her portrayal of the Young Girl was so very moving, her Act 2 solo unforgettable. Alexander Campbell was superb in his role as The Boy, and combined with the lovely Fumi Kaneko as the Gypsy Girl The Royal Ballet offered us all a stunning cast. What we took home with us was Yasmine Naghdi's most beautiful solo in Act 2. To be treasured forever! The audience clearly adored this cast and never have I experienced cheers and applause starting whilst the curtains were still up and the Orchestra still playing.In fact we loved this cast so much we have booked again to see them on Saturday (Naghdi/Hay). Enjoyed 'Asphodel Meadows', loved 'The Two Pigeons' - the music, the dancing, the choreography, the staging and sets, the lighting, and of course the doves! Also saw the Royal Ballet School 'The Cunning Little Vixen' followed by 'The Two Pigeons' and again enjoyed the first ballet, and simply loved the 'The Two Pigeons'. It was fantastic, the production and the music were wonderful. It was great to have a mixed programme! There isn't a separate thread for the mixed bill of The Cunning Little Vixen by the Royal Ballet School (performed to the non-singing suite arranged by Peter Breiner) and The Two Pigeons, so I'm adding a comment here. Liam Scarlett has done a wonderful job creating a ballet that brings out the youthful attributes of the students that are found in the story of the Vixen and her family and friends, without letting it get childish or twee. The choreography is mature - at times tricky, which the students pull off with aplomb - and full of depth, but not too difficult for the students. It was a delightful piece, and a pity it only receives a few performances this season. It would be great if it doesn't disappear from the repertory after this season. I knew that Yasmine Naghdi would make a lovely Young Girl in her debut in the role (I was sorry not to be able to attend Beatriz Stix-Brunell's debut this season as well) but thought she faced a double challenge having to learn the role with 2 different new partners (Alexander Campbell and James Hay) after an unfortunate injury sidelined William Bracewell. I was lucky to catch the matinee performance and what a brilliant couple she and James Hay made! They both brought out the whimsical comedy and charm of the story - he isn't merely annoyed with her cheeky interruptions and inattention, but he is occasionally won over by her playfulness, to an extent that they look like they know they're slightly silly and comical, which is a little more interesting and enjoyable than the occasional one-note interpretation of "she is annoying, he is irritated" that Act 1 can easily become. Hay also emphasises the remorse he feels on abandoning her at the reconciliation, which when juxtaposed with Naghdi's relief and joy at his return is bittersweet and moving, especially when matched by the beautiful playing of the music by the orchestra. We were very glad we had made a last minute decision to catch this performance! 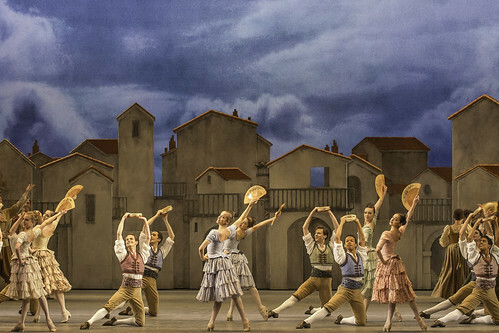 Kudos to Kaneko, Zucchetti, Yudes and the rest of the cast for incredible performances in what must have been an exhausting week with the opening of Don Quixote and many colleagues away through injury, maternity leave and filming commitments as well. Bravo! The Royal Ballet First Soloist will be replaced due to injury. Your Reaction: What did you think of The Royal Ballet's La Bayadère? Audience responses and press reviews of Natalia Makarova's production of this 19th-century classic ballet.